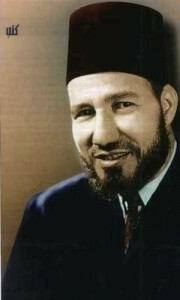 Founded in Egypt in 1928 by Hassan al-Banna, the Muslim Brotherhood these days is more often mentioned in the news than ever before as the current political crisis in Egypt continues to develop. In the retrospective collection of English translations of foreign radio and television broadcasts as well as newspaper articles that constitute the Daily Reports of the U.S. Foreign Broadcast Information Service (FBIS), one finds just for the period 1956-1996 some 2,700 items, largely translations of broadcasts, on the Muslim Brotherhood and another couple of hundred under the formulation Moslem Brotherhood. In order to give a little sense of how The Brotherhood, as it is sometimes called, appeared in those Arabic and other broadcasts, let us consider a few examples beginning with Colonel Gamal Abdel Nasser [his surname is transliterated “Nasir” by the FBIS translators and editors] in 1957. From an FBIS Daily Report. Click to open. Nasser, the second President of Egypt, was succeeded by Anwar El Sadat, who himself was assassinated, allegedly by fundamentalists, on Oct. 6, 1981. Here is an excerpt from the speech Sadat gave on Sept. 30, 1981, before the closing session of Second National Democratic Party Conference in Cairo as translated from the Cairo Domestic Service text. Events escalated last year. The situation was charged on the other side among the Islamic groups and the Muslim Brotherhood. You heard me explain the situation to the two parliament councils -- the People’s Assembly and the Consultative Council -- and to the advisers. All of you and the people heard the resolutions which I adopted to stop this sedition -- the religious sedition -- which would have harmed this country more than anything in the past, had it been destined to take its course. The most perilous thing for us to do is to be divided, and the most perilous thing that can happen to us is for some -- Muslims or Copts -- to exploit religious feelings for political ends. Here is a brief summary on the fate of the plotters. Indictment of Plotters -- MENA [Middle East News Agency] transmitted the text of the indictment released by the military prosecutor against 24 persons involved in the 6 October assassination of President Anwar as-Sadat. The document notes that the various offenses call for the death sentence. On the eve of his death As-Sadat felt that he was losing the ground beneath his feet and falling into ever greater isolation in his own country, and he rushed about, striking out in all directions. The “Muslim Brotherhood,” which was opposed to Camp David, was proscribed, and more than 1,000 of its members, including its leader U. al-Tilmisani, were arrested. 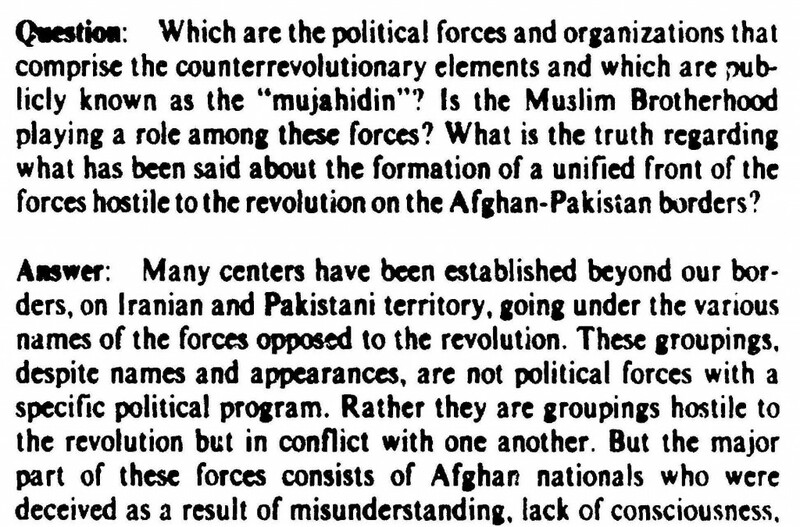 Question: Which are the political forces and organizations that comprise the counterrevolutionary elements and which are publicly known as the “mujahidin”? Is the Muslim Brotherhood playing a role among these forces? What is the truth regarding what has been said about the formation of a unified front of the forces hostile to the revolution on the Afghan-Pakistan borders? Answer: … the major part of these forces consists of Afghan nationals who were deceived as a result of misunderstanding, lack of consciousness, and the false slogans about the protection of Islam as well as a result of fear of, and terror by, these gangs. At the center of these forces stands the Muslim Brotherhood, which, prior to the revolution, was the basic force opposed to development and progress. In our country the Muslim Brotherhood has worked in full coordination with the CIA and the reactionary forces.